Ackee is a popular Caribbean vegetable that resembles scrambled eggs in terms of looks, taste and texture. It is often combined with avocadoes. This dish would make an impressive starter, or a light lunch or supper dish if served with salad. Serves 2 to 4. 1. Heat the butter and oil in a frying pan. Add the onion, garlic, scotch bonnet pepper (if using), and celery. Fry until the mixture has softened, but hasn’t browned. 2. Add the peppers, tomatoes, and lime juice. Season with salt, pepper, herbs, and allspice. Simmer on low heat for 5 minutes. 3. Stir in the ackee and cook on low heat for a further 5 minutes. Let the mixture cool. 4. Peel, stone and halve the avocadoes. Stuff with the ackee mixture, and serve on a bed of flavoursome rice. Thank you for your comments, Jim. 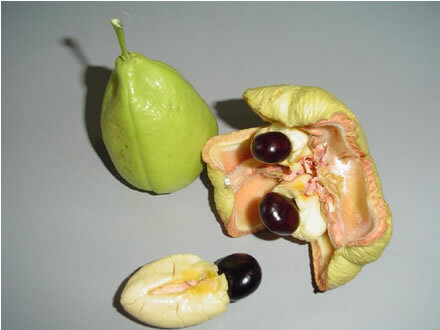 Yes I agree that you can’t eat raw ackee, but I just wanted to show a picture of what ackees looked like. Most readers, certainly here in the UK, wouldn’t have come across – or even heard about – the fruit and would have no idea what it looks like. The few who do would have used ackees from a can, as it is rarely available fresh here.